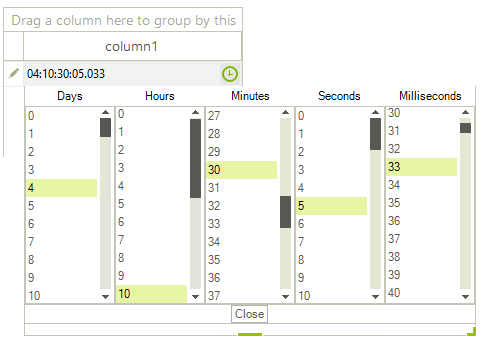 GridViewTimeSpanColumn provides data entry and formatting for TimeSpan data types. 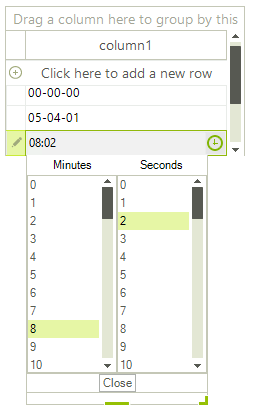 You may enter the TimeSpan value directly into the editor or select the different parts for the TimeSpan value in the drop down. The FormatString property sets the format of the TimeSpan when the cell is not currently being edited. The Format property is used to format the value once the user clicks on the cell to invoke the editor. The activated editor takes into consideration the applied Format and thus, only the specified parts of the TimeSpan will be loaded when the drop down editor opens. If we do not use the CellEditorInitialized event, but the CellBeginEdit event (which is fired before CellEditorInitialized), our Format setting will be overridden by the initialization of the editor. Mask - The value will be edited in masked edit box. Popup - The value will be edited only in pop-up. Combined - The value is modified both in masked edit box and pop-up. The default value is TimeSpanEditMode.Combined. DataType Gets or sets the data type of the column. By default it is TimeSpan. ExcelExportType Gets or sets the type of the excel export. Format Gets or sets the format of the TimeSpan displayed in the editor. The default value is "dd:hh:mm:ss.fff". Minimum Gets or sets the minimum value. The default value is "00:00:00". Maximum Gets or sets the maximum value. The default value is "100:00:00".